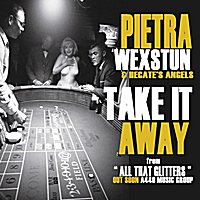 New digital single from Pietra Wexstun & Hecate's Angels from the new album "All That Glitters ". "A stylish box of delights - whisky smooth and air conditioning cool" - HEARSAY MAGAZINE, U.K.
Nice to see Pietra getting top billing here. Their is song crafting growth in each album. This one seems more energetic than previous efforts. Take it Away is a catchy hook. I particularly like the funkiness of She Done Him Right, The Guitar and Violin of Stan Ridgway and Lazlo Vickers on Lonesome Stranger and Pietra showing her chops on More Fun Than Anything. An eclectic mix on this cd. Everything from Rock, Jazz, Calypso, Boss Nova & Funk. Bill Blatt and Bruce Zelesnik make for one solid rhythm section. While All That Glitters might not be gold, Pietra and her band of angels sure are. Being a fan of the first two albums, this track from the new one soon to come has got its hooks in me! and it's got all the elements of what I love about her work, from the great lyrics and jazzy textures to well, the exotic atmosphere it conjures up in your mind. Can't wait for the new one to be released. Only 5 stars we can give out here ? How about 10 ! please make more. Great cover too!